Skyscrpr aims to drasitcally simplify online advertising. You can create ad space inventory in seconds using their simple interface that has drag and drop placement integration with Blogger, Tumblr, WordPress, and Squarespace. It is incredibly easy to use different ad sizes and pricing models (CPM or percent of pageviews) to find what works best for you. 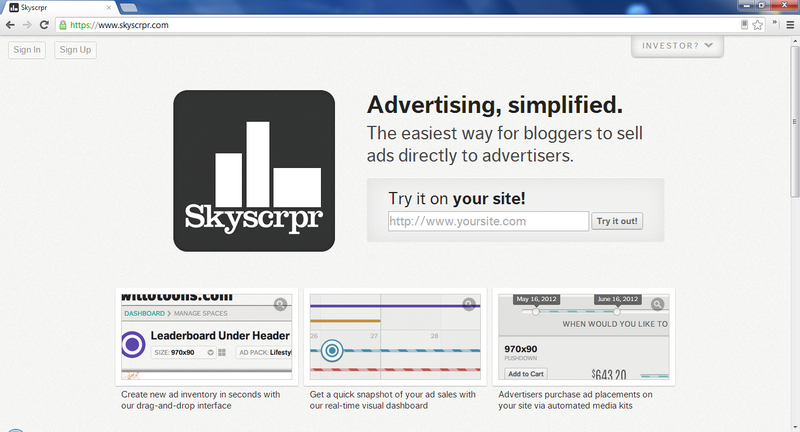 Once you add the code to your site it remains blank until an advertiser buys your ad space. The ability is there to have house ads of your choosing display (AdSense, Amazon Associates, etc.) until a space is purchased. Every site gets a profile built that can include your site's Twitter and Facebook stats along with Google Analytics data and Klout score so that advertisers can get a better understanding of your web property. Follow them on Twitter, AngelList, and Tumblr.